ABA offers a large selection of lidding equipment to place and secure almost any material and style of lids. As with all of our filling machines and equipment, our lidding line is made with the highest quality component parts and can be customized to be the most beneficial for our customers. 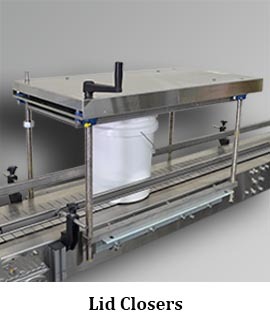 In the lid placing category, we offer high speed lid dropper units, semi-automatic lid chutes, and fully automatic lid placers. This equipment can be optionally supplied with hoppers for extra capacity, bung orientation systems, and no-lid detectors to rapidly identify lidless containers before a spill occurs. Our lid placers are designed to increase productivity, accuracy, and speed. 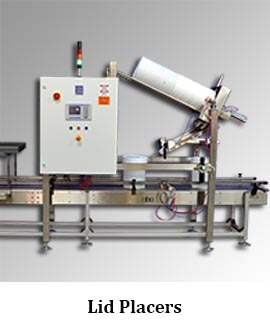 When it comes to lid closers, ABA is proud to offer a number of options for our customers, including: roller lid presses, lid press plates, and lid crimpers. We offer both semi and fully automatic options and have recently designed and developed a powered roller lid press which works in conjunction with a powered conveyor to seal lids. Regardless of your lidding machinery needs, you can depend on ABA for high quality and superior performance. Please contact us today for more information about the machines we offer or to get advice regarding the best lidding equipment for your requirements.